Those Fabulous Private Label and Catalog Outboards! 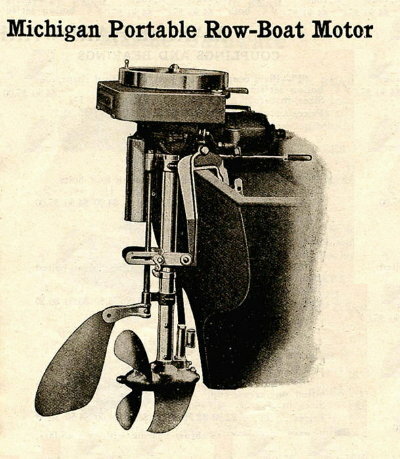 Private brands were outboards sold by mail-order catalogs and retail stores not related to actual outboard manufacturers. For an overview of Private Brand outboards see the Featured Outboard: Catalog & Private Brands section of the website. The list of catalog and private brands is extensive; Motorgo, Hiawatha, Atlas Royal, Sea King, Sea Bee, Sea Flyer, Corsair, Voyager, Waterwich, Elgin, Wizard, Firestone and Ted Williams are just a few! 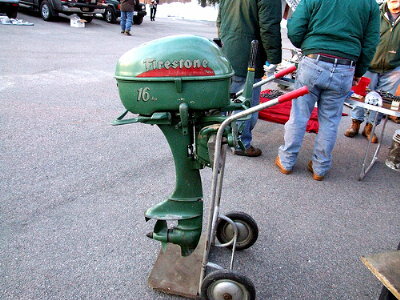 In 2010 The Yankee Chapter Formal Meet will celebrate all the private brand outboards. The Yankee Chapter AOMCI formal wet meet at Indian Well State Park in Shelton CT will be on Saturday September 11th 2010. Indian Well State Park is located on the Housatonic River; the park sports ample parking, a boat ramp, plenty of beachfront for boats to be pulled up, barbecues and port-a-potties. There will be a sign in and $5 per member family attending the meet to cover the cost of the event, prizes, etc.. 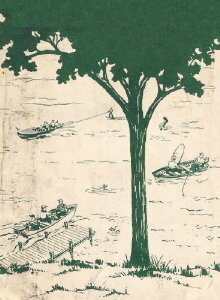 Directions can be found at the bottom of this page. For GPS or MapQuest use 4 Indian Well Road, Shelton, CT. The Yankee Chapter of the AOMCI is celebrating Private Label and Catalog Outboards all this year. This year's formal awards will be devoted to Private brands exclusively. We encourage the display of as many different marques as possible! Class 7) Private Brands Display (Be creative! Literature, signs, accessories, tools, etc....?) All items must be related to Private Brand outboard motors. Awarded to the oldest running catalog or private brand motor at the meet! All outboard motors entered must be in operational condition. Help make the meet fun for all, share your knowledge and enthusiasm for old outboards – why not bring a friend who is not a member! Attendees to the meet will want to bring a lunch or several restaurants are a short distance from the park – some even accessible by boat! There are grills, picnic tables and porta-potties available at the park. Alcoholic beverages are prohibited at all AOMCI events. The Connecticut DEP has rules on safety, speed and decibels for boats operating at Indian Well that are strictly enforced - most race boats and motors will not comply. Please be certain all boats run at Indian Well meet the State of Connecticut's requirements, have appropriate state registration, insurance and safety gear on board. Information on these requirements can be found at the CT DEP website. Also, here is the link to the Indian Well State Park website with additional information and directions. All boats traveling on the river should stay to their right when traveling up or down-river. Please use caution and courtesy at all times and particularly when operating near the boat ramp, beaches or in congested areas. Have a fun and safe day on the water! NOTE: Please contact the host if you can bring a sturdy and stable sawhorse for use in the display area. People displaying large motors or bulky/heavy items should plan on bringing their own stands. Please be sure that all items displayed are secure and stable. From Route 8 north: take Exit 14. At the end of the exit ramp take a left, and then take the next left onto Howe Avenue (Rt 110). Go north for approximately 2½ miles. Indian Well State Park will be on the right. From Route 8 south: take Exit 14. Take a right onto Howe Ave. (Rt 110) and drive approximately 2½ miles. Indian Well State Park will be on the right. A Fun Day On The Water! When boating, please act responsibly and obey all rules of the road and local laws regarding speed and noise limitations. Please be sure that all equipment is operated in a safe and respectful manner. The consumption of alcoholic beverages at Yankee AOMCI functions is strictly prohibited. You must be an AOMCI member in good standing or be the guest of a current member to participate in Yankee Chapter meets.